The time to visit Krispy Kreme is when the “Hot” sign outside is lit. That tells you freshly baked, warm doughnuts are coming out of the bakery into the shop. They are terrible for you, nothing but sugar and fat—and they are irresistible! I should add that, alas, it doesn’t look like this any longer. 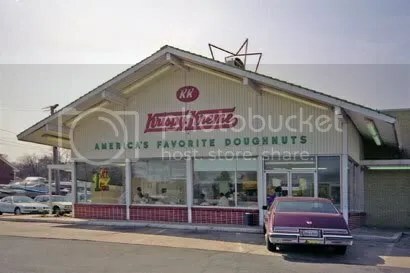 I took this photograph around 15 or 20 years ago, and sometime fairly recently, the old building was pulled down and a new, improved (and featureless) KK coffee and doughnut shop has gone up in its place. The doughnuts are still wonderful, though. You are currently browsing the blog archives for the day Thursday, May 25th, 2006.